What you missed if you didn’t obsessively watch the first night of the Democratic National Convention. Jul. 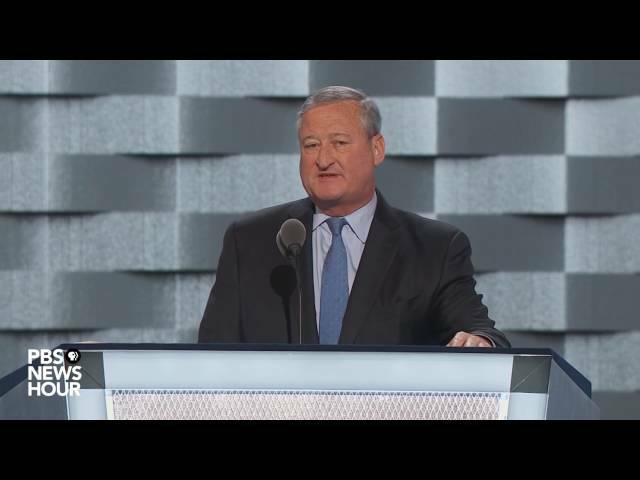 26, 2016, 6:30 a.m.
Billy Penn recaps the night inside the Wells Fargo and the day outside in Philly with the DNC Hangover. Elizabeth Warren was the keynote speaker. Bernie Sanders was the most anticipated on the lineup. But Michelle Obama stole the night. The First Lady drew raucous applause, cheers and tears as spoke largely about her daughters and joining together with Hillary Clinton — the woman who was once running against her husband. It wasn’t the ideal start for a party attempting to show unity. The prayer that helped usher in the evening’s festivities was interrupted by Bernie chants. Those continued throughout the first few speakers, as did boos at mentions of Clinton. The boos faded away as the night went on, but the Bernie chants came up again and again. General theme: Booker shared a note of optimism for the present and future of America, so long as Trump is not elected. General theme: Perhaps more than anyone besides Elizabeth Warren, Franken — the SNL alumni-turned-Minnesota-Senator — relied on punch lines as he went after Trump. General theme: Obama told stories of triumph from the last eight years and America in general and shared why Clinton is her candidate of choice to continue to bring progress for the country. General theme: The 11-year-old Ortiz shared her fears of Trump and her belief that Clinton is best for immigrant families such as hers. Her parents are undocumented immigrants. General theme: Large portions of the crowd badly wanted to hear Bernie, and he responded by talking about how they continued a movement and giving a not overly-warm endorsement of Clinton. General theme: Warren built up by talking about her rise from a humble upbringing in Oklahoma to saying how Trump could ruin the opportunities Americans currently have. There are plenty of other celebrities expected to attend. Here’s a running list. Today was the day of mass protests in support of Sanders. Beginning this morning after the senator addressed delegates at the Convention Center (and was booed by some of his own supporters,) demonstrators gathered in Center City and later marched down Broad Street to the Wells Fargo Center. Outside the area where the convention was taking place, some unrest ensued when protesters attempted to climb over a small fence surrounding the security perimeter around the event space. Philadelphia Police told reporters at about 6:45 p.m. that no one had been formally arrested, but 55 people who jumped the fences were briefly “detained” and issued citations for disorderly conduct. They weren’t arrested because Philadelphia recently decriminalized nuisance crimes like disorderly conduct for this reason. Lauren spent more than 6 months in the hospital after 9/11 recovering from severe burns. As senator, Hillary Clinton helped Lauren get the care she needed.